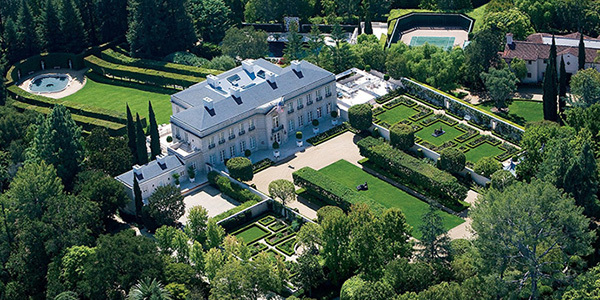 From TRD Los Angeles: The home of late Univision chairman Jerrold Perenchio is set to hit the market for $350 million. The Sumner Spaulding-designed estate, which is known as “Chartwell,” comprises more than 10 acres in Bel Air and dates back to 1933. Coldwell Banker Global Luxury, Hilton & Hyland and Berkshire Hathaway Home Services are marketing the property on behalf of Perenchio’s estate, according to a release from the brokerages. The Hollywood mogul, who reportedly represented the likes of Marlon Brando and Elizabeth Taylor, died of lung cancer in May. He bought the initial site in 1986 and then expanded the site over 30 years by acquiring additional adjacent properties. The main house totals 25,000 square feet, with a detailed limestone facade, a ballroom, a wine cellar and a period- paneled dining room, according to a statement from the brokerages. The grounds include manicured gardens, a tennis court, covered parking for 40 cars and a 75-foot pool. The home was featured as Jed and Granny Clampett’s house on “The Beverly Hillbillies” and Ronald and Nancy Reagan used to live next door. Hilton & Hyland co-founder Jeff Hyland did not immediately respond to a request for comment.